We had a one month follow-up appointment at the doctor's office today. All in all, it was a good visit. The doctor noticed that Baby T's chicken pox scars were lessening and his hair was... well, not so much lessening. It seems to be coming in with a vengence---especially the baldish spot that used to exist on the back of his head. He only needed one immunization today and H actually got her vitals checked and the doctor said she looked fine and unless I had any questions or concerns he really didn't need to see her until April! So she and her sister skipped off to the waiting room to color and watch PBS kids while I held Baby T as he kept a watchful eye on the smiling young man that I kept telling him was very nice. We were able today to finally come to a consensus on Baby T's birthdate. Based on his developmental markers, height, weight, and teething schedule, we (yes, we did include a medical professional on this decision) decided that Baby T is approximately 10 months old. We needed a birth date in March to make that all fall into place, though. Since we were given a heads-up when we went for our first visit in early December, we had started to think about a potential birthdate back then. During this same time, while preparing for our first post-placement home visit, I found the card (above right) in our adoption file and there wasn't a doubt in our mind as to what the birthdate should be. 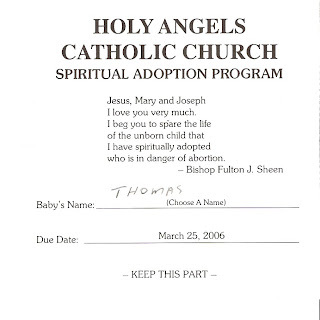 Through our church's spiritual adoption program, we had prayed for a child (whom we named Thomas) beginning in July of 2005---just about the time we started our home study paperwork and adoption process---for a baby girl in China at that time! It is amazing to see just how God's plans are so much bigger than ours. And while the spiritual adoption program focused on praying to end abortion (and we don't believe that to be the case in our children's situation, although we don't know that for sure) the ultimate goal is to pray for all new life created by God. "I praise you, for I am fearfully and wonderfully made. Wonderful are your works; that I know very well." Hooray for Baby T!! His birthday is 4 days after Mary Grace's! We are just beginning to plan baby's first birthday party to be hosted by her Auntie Betsy at her new home in Newtown. If Baby T is anything like his birthday-mate he is probably chewing on everything in sight right now b/c his teeth are giving him so much trouble! Can't wait to see photos of the visitors on the ark!! He is particularly fond of chewing on Mommy's arms, fingers, face, neck, etc...what ever he can get his little mouth around! I'm so excited they are such close birthday buddies! Yeah! What an amazing story! Thanks for sharing it with us!